Frieda Hardin, who bucked her parents' wishes and joined the U.S. Navy in 1918, then 80 years later gained acclaim as the nation's oldest living female veteran, died Wednesday at the Veterans Affairs nursing home in Livermore, California. She was 103, and just five weeks from another birthday. In recent years, Mrs. Hardin had been hailed in military circles for her service and her longevity, which she linked to devout Christianity, the absence of drinking, smoking, chewing and cussing, and excellent posture learned while in uniform. "I never had any bad habits in my life," she said in an interview three years ago. Mrs. Hardin was an honored guest and featured speaker, along with Vice President Al Gore, at the October 18, 1997, dedication of the Women's Memorial for veterans at the entrance of Arlington National Cemetery. She donned a neatly pressed Navy uniform and told women in the crowd of 30,000 people to "Carry on! You are doing a wonderful job!" She was featured on CNN and the front page of the Washington Post. Mrs. Hardin was one of 11,000 women to volunteer for service in World War I, at a time when women joining up were met with discouragement, said Audrey Mathewson, a Korean War veteran and president of the Sacramento Ex-Waves, a group of women Navy veterans who made Hardin an honorary member. "We all had a lot of respect for her," Mathewson said Thursday. "There are a lot of people I talk to who have no idea there were women in any branch in World War I." At age 22, while working in a department store in Portsmouth, Ohio, Mrs. Hardin walked into a local recruiting station and enlisted, angering her parents. They relented and Mrs. Hardin was assigned as a Petty Officer Third Class to the Norfolk Navy Yard in Portsmouth, Virginia. She made $41 a month and $2 a day subsistence pay as a clerk in the freight office. She stayed with the Navy for two years, serving after the armistice in Bremerton, Washington. "I heard about the Navy taking women on a Saturday night, and I signed up first thing Monday morning," Mrs. Hardin said in 1997. "I wanted to do something more, something bigger and better." Mrs. Hardin moved back to Portsmouth after her service and married the first of four husbands she outlived. She had a daughter and three sons. Each of the boys followed her into the armed forces and served in World War II. She later lived in Stockton and Lodi, and moved into the nursing home in Livermore about eight years ago. She was known there for her firm handshake, her perfectly matching outfits and hats, her frequent talk of Scripture and the attention she paid to men in the rooms around her. Mrs. Hardin had a stroke when she was 42 and was told by a doctor she had six months to live. That doctor died 35 years ago, but Mrs. Hardin never broke a bone in her life and remained sharp in her later years. "We can't grieve for her — we were fortunate to have her as long as we did," son Jerald Kirsten said. "She had such a wonderful life. I just wish we all could have been more like her, she was such a wonderful person." Mrs. Hardin is survived by her children, Mary Botto and Roy Kirsten of Stockton, Jerald Kirsten of Lodi and Warren Kirsten of Sacramento, as well as two nieces, 12 grandchildren, 25 great-grandchildren and 29 great-great-grandchildren. She will be buried in Arlington National Ceremony, where retired Brigadier General Wilma Vaught — who came to be an admirer of Mrs. Hardin as the president of the board of directors for the Women's Memorial — has planned a reception. A tentative date of August 24 has been set. A memorial service will be held at 7:30 p.m. Monday at First United Methodist Church in Lodi. Contributions in Mrs. Hardin's memory can be made to Women in Military Service for America Foundation Inc., 5510 Columbia Pike, Suite 302, Arlington, Virginia 22204. She joined the Navy in 1918, one of 12,000 women who served in WWI. Frieda Mae Hardin, who joined the Navy during World War I, when women were still denied the right to vote, and 79 years later came to represent the achievements of all the women in the armed forces, died last Wednesday in Livermore. She was 103. Wearing a World War I "yeomanette" uniform and a wide-brimmed hat reading "U.S. Naval Reserve," Mrs. Hardin provided the emotional high point at October 1997 ceremonies at Arlington National Cemetery dedicating the Women in Military Service for America Memorial honoring the almost 2 million women who had served in the armed forces. Making her way to the speaker's stand before an audience estimated at 30,000, Hardin was accompanied by her son Jerald Kirsten, a retired Navy captain. "Loud voice, mother," he said. Her audience heard her loud and clear. "In my 101 years of living, I have observed many wonderful achievements but none as important oras meaningful as the progress of women taking their rightful place in society," she said. "To those women now in military service, I say, 'Carry on.' To those young women who may bethinking about a career in the military service, I say, 'Go for it.'" The 10-minute talk brought three standing ovations and left many in the crowd in tears. When Frieda Mae Green was born September 22, 1896, in Eden Valley, Minnesota, a formal role for women in the armed forces could hardly be foreseen. Women had served as nurses in a quasi-military capacity, but none were in the regular Navy or Army. In March 1917, with America's entry into World War I imminent, Navy Secretary Josephus Daniels called on women to enlist in the Naval Reserve to free sailors for combat duty. Frieda's father, a railroad worker, had moved the family to Kentucky and then Ohio, and she had taken a job at a department store in the town of Portsmouth. One day in 1918, she saw a newspaper notice that a Navy recruiter was arriving. "I heard about the Navy taking women on a Saturday night, and I signed up first thing Monday morning," she would recall. Frieda's mother took her back to the recruiting station and told the Navy man that she could not sign up without her father's permission. But the next day, her father said, "Let her go," and off she went. She was among almost 12,000 women who served in the Navy during World War I as clerks, draftsmen, translators, camouflage designers and recruiters. They were formally designated Yeomen (F), for female, but were known as Yeomanettes. She was on active duty from September 1918 to March 1919 at the Norfolk Navy Yard in Virginia, performing clerical duties and receiving an outstanding grade in reading proficiency and perfect marks in obedience and sobriety, the three areas in which the Navy graded women. She would remain a teetotaler. By 1920, all the Yeomanettes were released from duty, and women would not be permitted to serve in the Navy again until World War II. After leaving the Navy, Frieda Green married William Kirsten, a chef, and they settled in the Lodi-Stockton area of California. She is survived by four children from that marriage, Capt. Kirsten of Lodi; Roy Kirsten of Stockton; Warren Kirsten of Sacramento, all military veterans; and a daughter, Mary Botto, of Stockton; 12 grandchildren, 25 great-grandchildren and 29 great-great-grandchildren. William Kirsten and three other husbands died earlier; the last was Robert Hardin. In speaking at the memorial dedication, Hardin said that "a world of opportunity" awaited women in the military. "For my part, I have always been very proud of my Navy service," she told the audience. "It is not likely that I will be meeting with you again, so I bid each of you a fond farewell." Among those in the crowd was a woman named Ann Darr, who had served during World War II in the Women's Air Force Service Pilots, or WASPs. Reflecting on that moment at the memorial, she would write: "When Frieda Mae Hardin spoke, reminding us she couldn't vote when she signed up, saying to the young people, 'Go for it!' we were almost ready to serve again." WASHINGTON, Aug. 24, 2000 -- Frieda Mae Hardin, the nation's oldest woman veteran, died Aug. 9 at age 103 in a nursing home in Livermore, California. Hardin's World War I service was broadcasted around the world in October 1997 when she spoke during dedication ceremonies for the Women in Military Service for America Memorial at the gateway to Arlington (Virginia) National Cemetery. Decked out in her World War II "yeomanette" uniform and a wide-brimmed hat inscribed with "U.S. Naval Reserve," she told an estimated crowd of more than 30,000 about her service to her country. She told the audience that her generation wasn't the first generation of women to serve the country. "But we did our part, serving with honor and distinction," said Hardin, who was born on September 22, 1896, in Eden Valley, Minnesota. "To those women who are now in military service, I say, 'Go for it!' You are doing wonderful work and it's very much appreciated." She addressed young women who may be thinking of a career in the military service. "You will find a world of opportunity waiting for you," she said. "I have always been very proud of my Navy service." She received three standing ovations for her 10-minute speech. Hardin and thousands of women like her paved the way for future women to serve in the U.S. armed forces. She joined the Navy as a "yeomanette" in September 1918 and served until March 1919. More than 12,000 women served in the Navy during World War I as clerks, stenographers, telephone operators, recruiters, draftsmen and camouflage designers. Hardin survived four husbands and is survived by a daughter and three sons. All her sons served in the military. 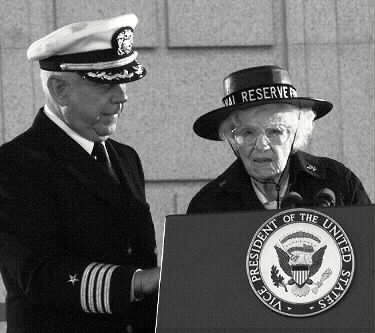 World War I Navy Yeoman Frieda Mae Hardin, 101, accompanied by her son, retired Navy Captain Jerald Kirsten, was a guest speaker at the October 1997 dedication of the Women in Military Service for America Memorial at Arlington (Virginia) National Cemetery. Hardin was the nation's oldest woman veteran when she died August 9, 2000, at age 103 in a nursing home in Livermore, California.